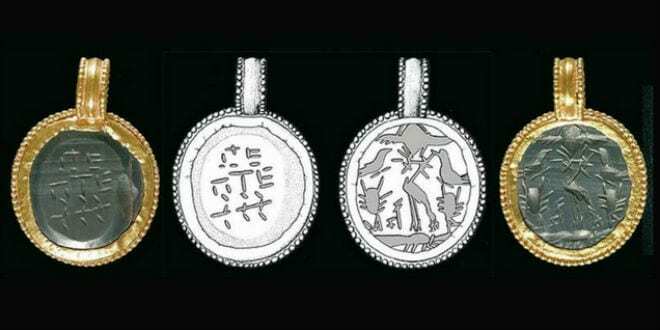 New Exhibition Tells Story of Sussita as Israel Transitioned from Paganism to Christianity - Breaking Israel News | Latest News. Biblical Perspective. Hippos, situated to the east of the Sea of Galilee, was founded in the second century BCE and destroyed by the strong earthquake of 749 CE. Over the past 18 years, the site, which lies within the Nature and Parks Authority’s Sussita National Park, has been excavated and explored by researchers from the Institute of Archaeology at the University of Haifa. The excavations have yielded many impressive and unique findings over the years, both from the period when the city was still pagan and from the Byzantine and Umayyad periods, when Hippos had a clear Christian majority. For the first time, the new exhibition at the Hecht Museum presents the story of this transition from a society that worshipped the classic Greco-Roman gods to one that adopted the Christian faith. The most fascinating finding in this context is a trove of 24-karat gold buckles and an amulet against indigestion. The amulet, with dimensions of 2.2 x 2.4 cm, is made from hematite and set into a gold pendant bearing an inscription in Greek with the command “digest!” The amulet itself is from the Roman period (the 3rd-4th century CE), but it was set into the gold pendant during the Byzantine period (the late 6th century CE). The researchers found the pendant in a stratum dated to the early 8th century CE in the North-East Church – in other words, some three to four centuries after the Roman Empire embraced Christianity. Together with associated findings, the researchers believe that the item was probably worn by an important Christian cleric, who continued to use it for its original purpose of warding off indigestion. Another finding on display at the exhibition is a small bone carved figurine, approximately 12 cm in height, depicting a dancing woman. On closer inspection, the woman turns out to be a “maenad” – one of the regular members of the retune that accompanied the processions devoted to the god of wine Dionysus. The figurine, which was found in a building adjacent to the church and has been dated to the Roman-Early Byzantine era, was probably set in a wooden box or casket featuring other images of the processions to Dionysus that have not survived. “The processions to Dionysus, who was usually accompanied by the dancing maenads, was dominated by ecstatic dancing, drinking to excess, debauchery, and rich manifestations of sexuality. Yet now we find one of the images most closely identified with this procession and licentiousness in a building next to a church,” Dr. Eisenberg notes. In addition to the small amulet and figurine, however, the site has yielded even more powerful testimony to the integration of the emblems of the pagan past in the Christian present. On the wall of a home not far from the North-East Church, an ashlar was uncovered bearing a fresco depicting the goddess of fortune Tyche (Fortuna in the Roman pantheon). Tyche is shown wearing a mural crown, which naturally represents the city-walls of Hippos. The North-East Church and the adjacent building were excavated by a delegation from Concordia University in St. Paul, Minnesota, headed by Prof. Mark Shuler. Dr. Eisenberg explains that Tyche was the goddess who protected Hellenistic and Roman Hippos. She appears on Roman coins from Hippos holding the reins of a horse or carrying a horse in her palm – both symbols of her role as the protector of the city. The motif of Tyche as the protector of Hippos was also chosen as the emblem for the new exhibition. “During the Byzantine period, Tyche became a municipal emblem embodying a local patriotism that had deep roots in the classical tradition. As time passes following the transition to Christianity, Tyche and the other former religious emblems probably lose their ritualistic characteristics and become cultural symbols that continue to accompany Hippos until the city was devastated and abandoned following the earthquake of 749. “Since Sussita National Park has not yet been prepared for organized visits for the public, the new exhibition at the University of Haifa’s Hecht Museum offers an exceptional opportunity to see a city that was founded over 2000 years ago and has now come back to life following 18 years of archaeological studies,” Dr. Eisenberg concluded.